Hockey is a funny game. Not often funny, “ha-ha,” but funny, “strange.” In Week 19, the Washington Capitals were barely five minutes from forcing an overtime that could have left them with a perfect week or, at the least, no losses in regulation. On the other hand, they were just 43 seconds away from being forced into an overtime that could have left them with a two-loss week. It is why all 60 minutes m matter in regulation and why hockey can be a funny game. No joke. 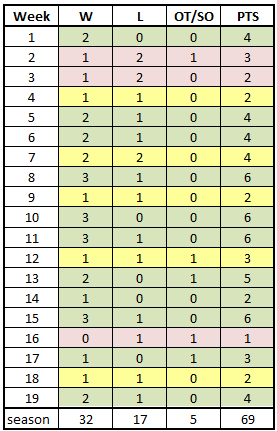 Week 19 made 11 times in 19 weeks that the Capitals finished with a winning week. 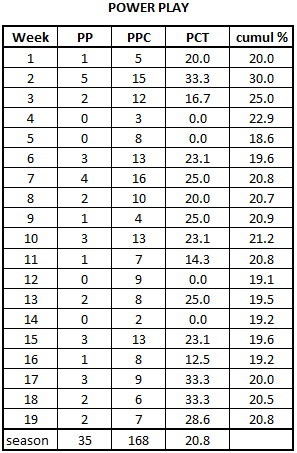 And before you scoff at “only” a 2-1-0 week, should the Caps go the rest of the season on that pace, they will finish with 106 standings points. It would be the 11th time in history that they finished over 100 points and seventh-most in club history. As it is, the 2-1-0 week allowed the Caps to maintain a five-point edge on second place in the Metropolitan Division, a spot now occupied by the Pittsburgh Penguins, although the Metro team that they might need to be looking at is the Philadelphia Flyers, who are just one point behind the Penguins at the end of Week 19 with a game in hand. What the Caps are, unsurprisingly, is behind last year’s points pace. With a 32-17-5 record at the 54-game point, they trail last year’s 37-11-6 mark. Then again, the Caps were on one heckuva hot streak, too, having gone 17-2-1 in the 20 games leading up to that 54-game mark. This club is a more modest 11-5-4 in its last 20 games. At the moment, that is pretty much the difference between the two seasons. Two games against the Columbus Blue Jackets to end the week wrapped up a portion of the schedule heavy with division games. Since December 30th, the Caps faced Metropolitan Division opponents 10 times, posting a division record of 6-2-2, the best intra-division record among Metro teams over that span of time. It was less an explosive offense than a consistent one in Week 19 for the Capitals. They scored at least three goals in each of the three games, giving them six straight games recording three or more goals. What made it a funny week (again, “strange”) was scoring three or more goals in each game without recording more than 25 shots in any of them and averaging only 21.7 shots for the week. For the second time this season the Caps scored four goals without the benefit of as many as 20 shots on goal. They did it against Columbus in the last game of the week, recording only 17 shots in a 4-2 win. They also did it on November 2nd, recording only 19 shots in a 4-3 win over the New York Islanders. It was the fewest shots on goal recorded in a game scoring four or more goals since January 9, 2004, when the Caps had only 16 shots on goal in a 4-1 win over the Carolina Hurricanes. Individually, Nicklas Backstrom and John Carlson led the team with a pair of goals apiece. Backstrom’s second goal of the week was the game-winner in the 3-2 win over Columbus in the middle game of the week. The goal, scored with just 42.9 seconds left in regulation, was Backstrom’s 200th career goal, all with the Capitals. He became the fifth player in team history to hit the 200-goal mark with the club, joining Alex Ovechkin (590), Peter Bondra (472), Mike Gartner (397), and Mike Ridley (218). Carlson’s two goals left him tied for seventh place in goal scoring among defensemen in the league, and his two points left him tied for fourth among defensemen, his 42 points trailing only John Klingberg (52), Brent Burns (47), and P.K. Subban (43). Evgeny Kuznetsov led the team in points for the week (1-3-4), his points in all three games extending his points streak to six games (2-7-9). He has points in ten of his last 12 games (3-10-13), three of them multi-point games, giving him 13 for the season. That is second-most on the club (Ovechkin: 16). Shots on goal allowed has become an issue again. Washington allowed 107 shots on goal for the week (35.7 per game) and 76 in the two games against Columbus to close the week. That made six straight games allowing 30 or more shots and 12 in their last 14 contests. Only six teams have allowed 30 or more shots on goal more times than the Caps, although they haven’t had to pay a heavy price (yet) for doing so. They have a 23-11-3 record in the 37 games in which they allowed 30 or more shots to date. It is worth noting though, that the Caps allowed opponents 30 or more shots only 31 times all of last season, sixth fewest in the league. They were 21-6-4 in those games. The startling number, though, is 35. In allowing Columbus 39, and then 37 shots on goal to close the week, the Caps total number of games allowing 35 or more shots rose to 20, tied for ninth-most in the league. That is more than double the number they allowed all of last season (nine). 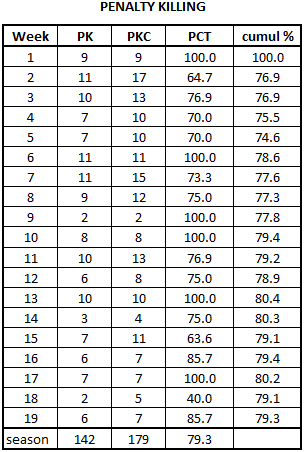 The sad numbers extended to shot attempts. With a 5-on-5 shot attempts-for of 40.56 percent, the Caps finished next to last for the week (Minnesota: 36.77 percent in three games; numbers from NHL.com). They were the worst team in the league in this statistic playing with a lead for the week (32.19 percent). The only reason they did not finish last was that Vancouver did not hold a lead in any of their games this week. It was not a bad week for the goaltenders, but the shots allowed made it look worse. Philipp Grubauer allowed the Vegas Golden Knights four goals to open the week, which is not an awful performance given that the Golden Knights have the second-best scoring offense in the league with almost three and a half goals per game. However, it was disappointing to allow two goals in a five minute stretch in the third period to allow Vegas to turn a one-goal deficit into what would become a one-goal victory. It was the first time Grubauer allowed more than three goals in a game since he allowed six goals on 28 shots in a 6-2 loss to the Colorado Avalanche on November 16th. From that game until he took the ice against Vegas he had been 4-1-2, 1.52, .950, with one shutout. It was also the first time this season that he allowed as many as four goals on home ice. Braden Holtby got the call for both games against Columbus and was the primary reason that the Caps won the week. As we pointed out in the summary of the first game against the Blue Jackets, in Columbus, “let’s face it, [he] pretty much stole this game.” He stopped all 17 shots he faced in the second period of that contest while the Caps were being pounded, 17-7, in shots on goal and by a 29-12 margin in shot attempts. It was a slightly different, if no less relentless, shots faced profile for Holtby in the second game against Columbus. He stopped 27 of 28 periods over the last 40 minutes, the last 27 in a row, to keep the Caps on the good side of a 4-2 decision. Holtby has been on a bit of a roller coaster, though. Over his last 13 appearances, he had a game with a save percentage under .900 followed by two over .900. He repeated that pattern twice, and then he had consecutive games at .900 or lower before wrapping up this week with a couple of excellent performances against Columbus. There was the good news, and there was the bad news. The latter first. Seven power play chances in three games is a low number. Not surprising, given that the Caps rank in the lower half of the league in power play chances overall (tied for 18th with 168). Only four teams had fewer chances and two of them (Florida and Detroit) played only two games. If there is a fact that stands out, though. Tom Wilson drew the game’s first penalty in the 4-2 win over Columbus to close the week. Hardly surprising. At the close of the week, Wilson was fourth among 278 forwards with 500 minutes of 5-on-5 ice time in penalties drawn per 60 minutes (5.51; numbers from Corsica.hockey). Carlson and Lars Eller had the power play goals for the week, and five different Caps had power play points (T.J. Oshie, Backstrom, and Kuznetsov added assists). Conspicuous by his absence on the power play score sheet was Alex Ovechkin, who recorded only one power play shot on goal for the week. The Caps were successful in peppering goalies with power play shots despite the lack of them from Ovechkin. They scored on two of 14 shots in just 11:34 of power play ice time for the week. Ovechkin was more decoy that teams seem to shade toward, based on the shot profile. Eight different Caps had power play shots on goal. John Carlson had five of them, perhaps in no small part not having openings to lay out feeds to Ovechkin for one-timers. Brett Connolly and T.J. Oshie – the middle of the 1-3-1 power play deployment – had a pair of shots apiece. After an awful Week 18 (2-for-5), the Caps rebounded in Week 19 for a very respectable week on the PK. It makes one hope Week 18 was just one of those weeks, for the Caps are at 85.7 percent or better in three of the last four weeks. The feeling should be tempered by the fact that the Caps faced the worst power play in the league – twice. Columbus went 0-for-6 in the two games to drop to 14.0 percent for the season. It would not be the worst power play in the league since the 2004-2005 lockout, but they can see the bottom of the valley from where they are (377th at the moment among 391 team results…parenthetically, Columbus has three of the worst 15 power play results in that span, including this season, most in the bottom 15). It was an uneven week in terms of efficiency, although it did resemble the week overall in the shots allowed aspect. Vegas managed four power play shots on goal in the space of 37 seconds before scoring what would be the only power play goal against for the week. The Caps did hold Columbus to 11 shots without a goal in 12:00 of shorthanded ice time, but they were better in Columbus (four shots in six minutes) than they were on home ice (seven shots in six minutes). 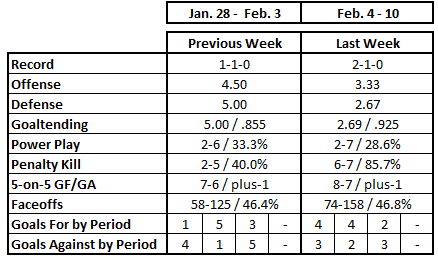 It was not a very good week in the circle for the Caps, and unlike Week 18 it was more a product of an off week among the big four (those with ten or more draws for the week). Nicklas Backstrom was the only Capital finishing the week over 50 percent and just one over the 50 percent mark at that. Lars Eller finished with 50 percent, as did Jay Beagle, although in the latter’s case that has to be looked at as something of a disappointing result. Evgeny Kuznetsov finished above 40 percent, barely. By zone, the Caps had a so-so time in the offensive end, although it was just one under 50 percent for the week. Winning more than 50 percent of their defensive zone draws might have kept down the scoring chances a bit, but it was not a dominating week at that end (53.2 percent, two wins over 50 percent). The neutral zone was an adventure (38.9 percent) and was the primary influence on a below 50 percent week. In a league where getting out to a lead early is a good indicator of success, the Caps had a decent week, winning the goal differential in the first and second periods. That they lost the third period goal differential was the result of those two goals allowed to the Vegas Golden Knights. 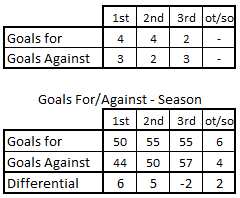 Those positive goal differentials in the first and second periods for the weeks tie to the Caps’ ability to hold leads when establishing intermission footholds. The Caps were tied with Vegas at both the first and second intermissions, but they led Columbus once at the first intermission (in the second game) and in both games at the second intermission before going on to win both games. It extended the Caps streak this season of not losing a game in regulation any game they led at either intermission. They are 19-0-1 when leading after 20 minutes and 22-0-2 when leading after 40 minutes. The good news in Week 19 was sticking it to a division opponent twice and bumping them out of the group of playoff-eligible teams in the Eastern Conference (Columbus is now one point out of a wild card spot, but they do have a game in hand on Carolina for the second wild card). The bad news was losing the season series to the Vegas Golden Knights, a team they could face (humor us) in a Stanley Cup final in what might be the most bizarre final matchup in league history. The Caps have led from in front the last two seasons, meaning that once taking a lead in the division, they were able to withstand any challenge over the rest of the regular season. It is not unfamiliar territory. It should give the club a measure of confidence as they head into the last third of the season, starting with Sunday’s game against the Detroit Red Wings. It might be a thinner margin that the Caps have had in the last two years, but those are two years of experience they take into the stretch. If someone had said the Caps would be in this position at the two-thirds mark of the season, you might have thought they were being funny – either “ha-ha” or “strange.” But here they are.